To paraphrase from one of Albarns earlier lyrics, "all the people, so many people", Gorillaz really have reached out to a much wider array of cultural backgrounds than Blur ever did. Behind us a group of children that must be no older than 10 chatter incessantly waiting for Gorillaz to hit the stage, no doubt disappointed when it's not the cartoon characters, but silhouettes of the musicians recreating the sound live on stage. Elsewhere older couples sit patiently next to mosher kids. It's a real mish-mash of people that have been brought together by the ensemble of characters on-stage. Never wanting to step totally out of the 2D and into 3D the band are introduced by two of Gorillaz as Muppets Style Statler and Waldorf characters who debate whether they should have a catchphrase or not, before going schizophrenic like through Little Britain, The Fast Show and assorted comedic landmarks of the past decade. It's an entertaining start which makes this not just another gig, not just a run through Demon Days but a full on musical experience to compete with the West End. The band which comprise former members of the Verve at times seem like the studio band for the guest characters to roll on and off stage for and while Neneh Cherry (Kids With Guns), Ike Turner (Every Planet We Reach Is Dead), Roots Manuva and Martina Topley-Bird (All Alone) all make this a very special performance non stand out more than the local children's choir who lift up "Dirty Harry" as the anthemic modern day hip hop tune it is. Only local bad boy turned good Shaun Ryder manages to steal the show with "Dare", so pronounced as rumours go because he couldn't say there. Shimmying around like a granddad after a few glasses of punch he's far removed from the man we saw ambling around on stage a few days ago at the MEN Arena for his own Happy Monday's show, but for many here today this song sums him up more than the Madchester scene ever did. 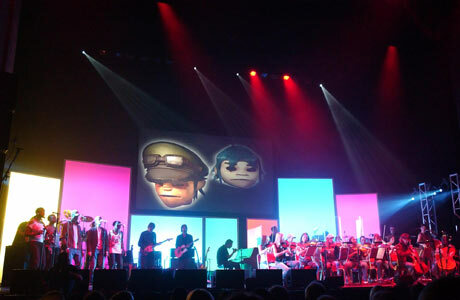 It's not until "Demon Days" itself that our musical conductor, the cultural pigeon, reveals himself properly for the first time taking stage on the falsetto. His voice slightly cracking and deliver a fragile end for what has been a brash show from the outset. There's something heart-warming about these 2D characters becoming human for the first time and revealing themselves open to the public. Closing on "Hong Kong", a solo Albarn song for the War Child project again offers a tender respite with an oriental finish to a truly multimedia multi-cultural night.